This program allows you to experience two different performing arts, Nihon Buyo (Traditional Japanese Dance) and Noh. 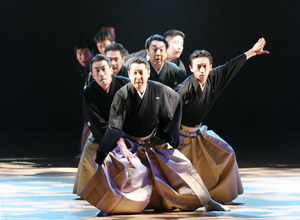 Nihon Buyo performance entitled “Bishamon” features “Bishamonten”, one of the gods associated with Kagurazaka, while Noh performance comprises the second half of "Ema", featuring the hiding of Amaterasu Omikami. After the performance there will be a lecture that explains the difference between Nihon Buyo and Noh. Some of audiences will be invited to the stage and can experience actor's movement. ＊All programs and performances are subject to change without notice.